Vintage Orthodox Baptism invitations for a baby girl or a baby boy coming in white pearlised colour paper with a retro baby trolley on it. The matching envelopes also are big white pearlised paper with classic diecut details. Your personalised wording is printed in plain red and black colour. 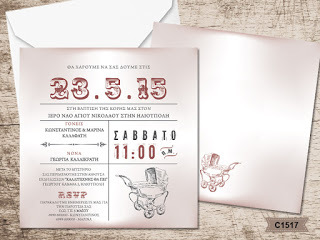 https://www.preciousandpretty.com/2017/05/vintage-christening-invitations-with-baby-trolley-C1517.html Greek Wedding Favors|Orthodox Crowns|Stefana|Baptism Invitations Vintage Christening invitations with baby trolley C1517 Greek Christening invitations with baby trolley for boys or girls Product #: Greek Wedding Favors|Orthodox Crowns|Stefana|Baptism Invitations_9196332736237092190 5 stars out of 5 reviews.